The grand master of gamelan I Wayan Gde Yudane and his Wrdhi Swaram Ensemble accompany three traditional and virtuoso Balinese dances. 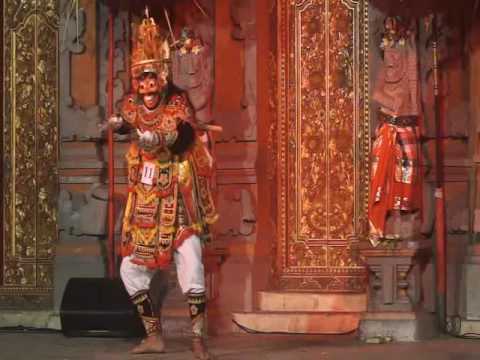 As soon as the mask is placed on his head, the performer of the jauk longor (dance of the demon) turns into a terrifying demon. With his protruding eyes, sardonic smile, large black moustache, mass of black hair and long sharp nails he looks like he’s walked straight out of a nightmare. The dance of the demon is considered to be one of the most difficult of the mask dances because the dancer must perform the exaggerated and violent movements of the demon to perfection, giving the impression that he could attack and devour the audience at any moment. In the topeng werda lumaku or topeng tua (dance of the old man) the dancer is an old, wise aristocrat looking back on his youth. The steps are slow and unsure, he uses his sleeve to wipe the sweat from his brow, his long grey hair and ringed fingers tremble with the exertion. Although the dance is slow and may look simple, it requires an intense physical tour de force on the part of the performer who must keep his arms raised throughout, tightly controlling each step, and moving each finger individually to express the old man’s emotions. By contrast, legong semaradhana is the tragic story of Semara and Ratih, the god and goddess of sexual love. In this dance, a demonic giant attacks the heavens. Only a half-human, half-animal personage can defeat him, but the god capable of creating this creature, Bhatara Siwa, is in deep meditation and refuses to be disturbed. Semara volunteers to wake him, despite the entreaties of his wife Ratih. Semara consoles her and they make love one last time before his departure. As expected, the god Siwa is furious at being awakened and burns Semara alive with his third eye. Ratih implores forgiveness but is also reduced to a heap of ashes.